The handset comes with a 6.7-inch display, the biggest screen in the Galaxy A portfolio to date. The Galaxy A70 features a stylish prism effect that reveals stunning gradient colors depending on light direction and reflections. 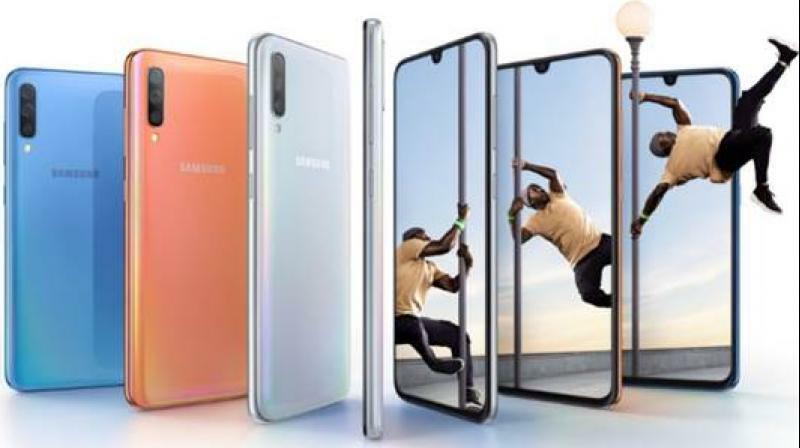 Samsung Electronics unveils the Galaxy A70, the newest smartphone in the popular Galaxy A range. Built with Samsung’s latest innovations and upgraded essential features, the Galaxy A70 showcases a stylish design, large infinity display, enhanced triple camera, powerful battery and seamless connectivity. This smartphone is designed for digital natives who want to capture, connect and share life as it happens. Featuring a 6.7-inch Infinity-U display along with the biggest screen in the Galaxy A portfolio to date, the Galaxy A70 provides an edge-to-edge experience to everyday activities. The Galaxy A70’s sleek and ergonomic design and a 20:9 display ratio delivers an immersive viewing experience whilst providing optimal grip. Available in four distinctive colours including Coral – this year’s on-trend colour, Blue, Black and White, the Galaxy A70 features a stylish prism effect that reveals stunning gradient colours depending on light direction and reflections. The Galaxy A70’s new intuitive positioning of the on-screen fingerprint scanner makes it more convenient than ever to control access to your phone for a more seamless user experience without requiring people to reposition their grip. Paired with Samsung Pass, people can sign into websites and apps by using biometric authentication as an easier and more secure way of logging in. This ease and convenience are enabled by Samsung Knox, Samsung’s defence-grade security platform designed to protect from chipset to software. Samsung Knox gives you a piece of mind about your privacy on the Galaxy A70, so you can use your phone freely with ease. Galaxy A70 features Samsung’s One UI platform to encourage productivity and focus. Designed to improve Samsung’s Galaxy user experience, One UI makes interactions enables convenient and smarter interaction including One Handed Navigation, making interactions easier by bringing the controls within one-handed reach. To make the experience more comfortable, consumers can enable One UI’s Night Mode to switch the display to evening time viewing and get more control over screen time with the Galaxy A70’s App Timer that gives visibility over your screen usage levels. Additionally, the Galaxy A70 includes Samsung Health, Samsung Pay, Bixby, and more.